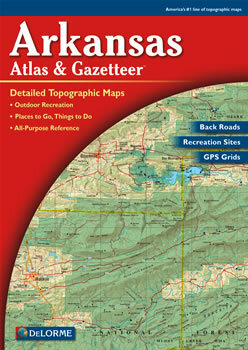 Discover Arkansas's diverse terrain with the Delorme Atlas and Gazetteer! This atlas has an index of the state's place names and map features. The back cover of this atlas has a large map of Arkansas with an overlying grid. Each cell of the grid contains the page number for a detailed map of that area. There are 45 large pages of detailed shaded relief maps, a two-page Arkansas highway map and a quick look-up mileage chart between the major cities in Arkansas! The physical and man-made features of Arkansas are detailed on these maps. These include: creeks, rivers, lakes, springs, wetlands, mountains, elevations, forests, trails, roads, highways, mines, oil and gas fields, airports and railroads. The atlas includes 19 additional pages of special reference information for the state's hiking trails, float trips, biking, campgrounds, fishing, hunting, golf courses, historic sites, children's attractions, scenic drives, national and state lands. The details in this up-to-date atlas make it a convenient topographic map collection, recreation guide and travel planner available in one handy book!